Being ‘licked into shape’ means to be made fitter, more efficient or better organised, says the Oxford Dictionary of English (ODE). So far, so mundane. But the ODE doesn’t explain the origin of the expression, which is far more interesting than its meaning: it’s all to do with bears and bestiaries. The word ‘bestiary’ usually refers to a medieval book that describes and illustrates a variety of animals, often with moralising overtones. A detailed explanation of bestiaries can be found on The Medieval Bestiary website. Bears give birth in the winter. 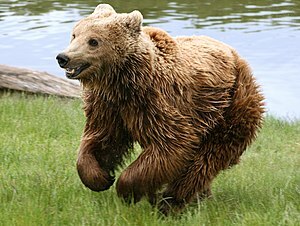 The bear cub is born as a shapeless and eyeless lump of flesh, which the mother bear shapes into its proper form by licking it (the origin of the expression “to lick into shape”). …the bear bringeth forth a piece of flesh imperfect and evil shapen, and the mother licketh the lump, and shapeth the members with licking…. For the whelp is a piece of flesh little more than a mouse, having neither eyes nor ears, and having claws some-deal bourgeoning, and so this lump she licketh, and shapeth a whelp with licking…. The derivation is also explained on The Phrase Finder. Bartholomaeus Anglicus: a man mucheth inclined to expatiateth. Verily. His prose is some-deal bourgeoning and needeth lickething into shape. Ah – if only it were true. It may be the origin of the phrase, but it’s a slur on the biology of bears. Or just biology in general. And bestiaries are not wildly reliable sources of information – they probably tell you that swallows sleep away the winter in the mud of ponds, too, as well as listing entirely fictional animals (I’m sure our ancestors saw the world differently to the way we see it, as well). New-born bears are bear-shaped, just as new-born people are people-shaped (though the mother licking clean a new-born cub probably gave rise to this mis-perception). Hi, Ron — yes, you’re right — I watched a programme about medieval life a while back, presented by some prof or other, and he was explaining how people saw the world completely differently at that time. Quite difficult to get a handle on from our modern perspective. Your final comment made me laugh! You know, it’s just registered – my pickiness gene was a bit slow kicking in – but as bears give birth during hibernation, and video-cameras with remote, fibre-optic, lenses were a long way in the future, how could anyone know about new-born cubs and the sow’s behaviour? Hi, Jo — yes, it is a lovely image. I’m sure there are many more such snippets in the old bestiaries. Finding the time to research that stuff is another matter!